I know there will be more, like Maggie Stiefvater’s Requiem, but there isn’t an active link/release date for it yet. I imagine a lot of the fall 2013 releases haven’t popped up yet so there will likely be a part 2 of this further into the year. 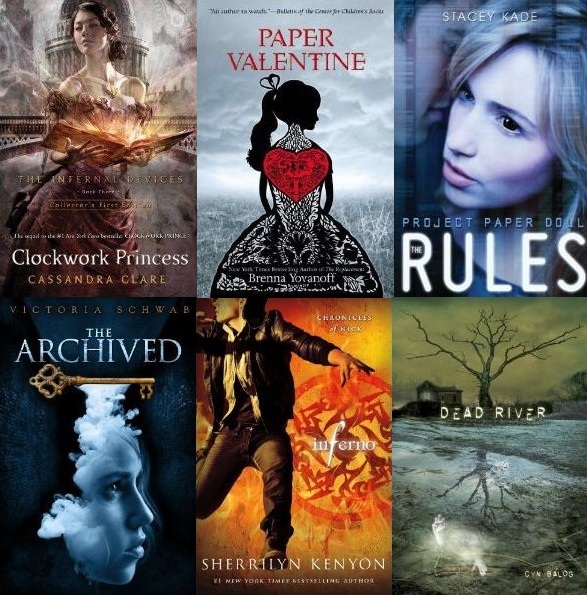 What books are you most looking forward to in 2013? Do you pre-order? Not only the books I’ve read, but the books I’ve acquired recently! Yeah, I know… you’re thinking – Sarah, you got like 37 books for Christmas. You can’t possibly need more! – But you’d be wrong. There is always room for new books in my heart. True, I have plenty to read, but that doesn’t mean I’ll be able to totally resist the urge to buy books as they come out or pass up opportunities like the last few I’ve had to purchase books without it costing me a thing. You want an explanation, right? Well for one, I received a $50 gift card to Amazon from one of my best friends and I still had a $25 gift card to Barnes & Nobles left over from Christmas. In addition to those gifted cards, I received two offers from Deal of the Day and Groupon for a $20 gift card to both Amazon and Barnes & Nobles for half the price. I couldn’t pass up these opportunities. So do the math… that’s a total of $70 to Amazon and $45 to Barnes & Nobles… we’re talking lots of books here guys. And so this is what I bought and have already received or can expect to receive over the next two months! First I purchased and received I Am Number Four (Lorien Legacies, Book 1) by Pittacus Lore, Fire (Graceling, Book 2) by Kristin Cashore, and Darkfever (Fever Series, Book 1) by Karen Marie Moning. My next book purchases, which I can expect to arrive sometime this week, were Trapped by Michael Northrop and Unearthly by Cynthia Hand. And the rest of my book purchases were books I know I will just have to have on their release dates so I pre-ordered them. At the end of February/beginning of March I will receive Darkest Mercy (Wicked Lovely, Book 5) by Melissa Marr, Demonglass (Hex Hall, Book 2) by Rachel Hawkins, and Dark-Hunter Manga Vol. 4 by Sherrilyn Kenyon. Then towards the end of March/beginning of April I will receive Invincible (Chronicles of Nick, Book 2) by Sherrilyn Kenyon, Daughters of the Moon Vol. 2 by Lynne Ewing, and City of Fallen Angels (Mortal Instruments, Book 4) by Cassandra Clare. I know the next two months are likely to be filled with re-reading some of these series continuations predecessors instead of some of the still new books I have waiting in my to-be-read pile, but I just can’t help it. Some of these new arrivals I’m anticipating so much that it’s taking everything I have to actually wait to re-read their series now. While I wait for them to arrive though, or be close to arriving, I will continue to plow through my to-be-read pile at the steady pace I’ve been keeping. Today I picked up Other by Karen Kincy. I didn’t really intend on reading for long, but 40+ pages later I still hadn’t put it down. If I keep reading tonight at that rate, I will likely finish it tomorrow which in my world equals good book! I must show off the beautiful new additions to my book collection. They weren’t even supposed to arrive until Friday, but they are all here early!!! I realize this is far more than I said I was allowed to buy this month and for that I will fail that goal come the 7th of August, but maybe if I read more than I anticipated in my goals I can somehow justify them balancing each other out? I wanted to take a picture of how pretty all of their covers were, but my camera mixed with the poor daylight coming through the window wasn’t cooperating very well so this is them, my new pretties. 😉 I seriously just smile looking at them. I know, so nerdy. I REALLY need a bookshelf soon, these little piles every month are really starting to add up. They need a proper home! Alright, now to fight the urge to continue reading “Linger” since I’m scheduled to be writing tonight. Let’s hope I succeed! Hi, my name is Sarah and I am a bookaholic. That being said let me share my latest book purchases with you. Initially “Hex Hall” by Rachel Hawkins was waiting in my shopping cart, but it is so good that I know I won’t be able to stop reading the library copy I currently have in my position, therefore the need to own it right this minute is not necessary (it can wait for a little while). So I swapped it out for something else and purchased the following books last night on Amazon. Description from Amazon : He holds the secret that can end the world. The truth: Nicholas Flamel was born in Paris on September 28, 1330. Nearly 700 years later, he is acknowledged as the greatest Alchemyst of his day. It is said that he discovered the secret of eternal life. The records show that he died in 1418. But his tomb is empty. The legend: Nicholas Flamel lives. But only because he has been making the elixir of life for centuries. The secret of eternal life is hidden within the book he protects — the Book of Abraham the Mage. It’s the most powerful book that has ever existed. In the wrong hands, it will destroy the world. That’s exactly what Dr. John Dee plans to do when he steals it. Humankind won’t know what’s happening until it’s too late. And if the prophecy is right, Sophie and Josh Newman are the only ones with the power to save the world as we know it. Sometimes legends are true. And Sophie and Josh Newman are about to find themselves in the middle of the greatest legend of all time. P.S. Sophie and Josh Newman are 15 year old twins… you would think the description would say that. Also this is book one of six, four of which are already out. Description from Amazon : What if you had only one day to live? What would you do? Who would you kiss? And how far would you go to save your own life? Samantha Kingston has it all: the world’s most crush-worthy boyfriend, three amazing best friends, and first pick of everything at Thomas Jefferson High—from the best table in the cafeteria to the choicest parking spot. Friday, February 12, should be just another day in her charmed life. Instead, it turns out to be her last. Then she gets a second chance. Seven chances, in fact. Reliving her last day during one miraculous week, she will untangle the mystery surrounding her death—and discover the true value of everything she is in danger of losing. Description from Amazon : Incarceron is a prison so vast that it contains not only cells, but also metal forests, dilapidated cities, and vast wilderness. Finn, a seventeen-year-old prisoner, has no memory of his childhood and is sure that he came from Outside Incarceron. Very few prisoners believe that there is an Outside, however, which makes escape seems impossible. And then Finn finds a crystal key that allows him to communicate with a girl named Claudia. She claims to live Outside- she is the daughter of the Warden of Incarceron, and doomed to an arranged marriage. Finn is determined to escape the prison, and Claudia believes she can help him. But they don’t realize that there is more to Incarceron than meets the eye. Escape will take their greatest courage and cost more than they know. Description from Amazon : Zara collects phobias the way other high school girls collect lipsticks. Little wonder, since life’s been pretty rough so far. Her father left, her stepfather just died, and her mother’s pretty much checked out. Now Zara’s living with her grandmother in sleepy, cold Maine so that she stays “safe.” Zara doesn’t think she’s in danger; she thinks her mother can’t deal. Wrong. Turns out that guy she sees everywhere, the one leaving trails of gold glitter, isn’t a figment of her imagination. He’s a pixie—and not the cute, lovable kind with wings. He’s the kind who has dreadful, uncontrollable needs. And he’s trailing Zara. Also arriving this week because the release date has changed and I pre-ordered it months ago, Maggie Stiefvater’s “Linger” which I’ve already talked about HERE. In conclusion I have to add how badly I want to read the “Percy Jackson & The Olympians” series now after seeing “The Lightening Thief” last night. I already had the box set in my wish list, but it’s rather expensive and will have to wait to be purchased until a holiday like Christmas or my birthday so it will be a while. Anyway the movie was fantastic, for anyone interested in knowing.